View our Next Day A6 Flyers, DL Flyers and A5 Flyers with a choice of card. 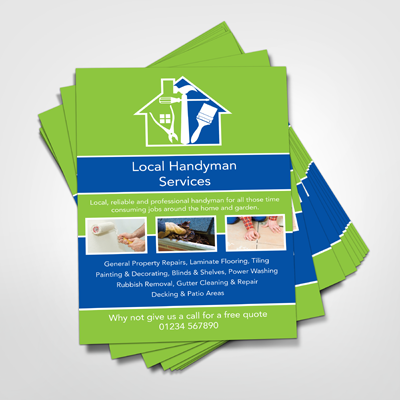 Next day leaflet printing is the perfect way to develop your business or advertise your event. Regardless of the event you are planning or the profession you are advertising, producing a set of leaflets is an excellent way to advertise your services. Leaflets provide an excellent way for you to reach out to your customers, building on existing business and generating new custom. If your business is continually developing, updating your leaflets and distributing them is a great way to keep your advertising up-to-date. Leaflets provide an engaging way to communicate with your customers. Organising the production of your leaflets couldn't be easier. We are able to offer a fast and efficient service, whereby if you order by 1pm, next day delivery is available. This allows you to start distributing your leaflets quickly, reaching potential clients and generating interest in your business in 24 hours. Sometimes time is of the essence and you may not have the time to produce your own designs. To cater for your needs even further we are able to offer a professional design service alongside a selection of templates for you to choose from. You can personalise your leaflets and use our simple online ordering process to place your order today. Print quality is important. You can choose a from a selection of paper weights with a choice of three finishes; 130gsm gloss, 170gsm gloss or 170gsm silk. Each finish is of a high standard and perfect for your next day leaflets. Prices for our next day leaflet printing service start from as little as £27 and includes free delivery to a single UK address. Our next day leaflet printing service is perfect if you want high quality results, quickly.